This morning was strange getting a call from B’s Dad saying he was on his way over with donuts to see the girls at 7 am! Oops, my bad. I didn’t realize it was 8:00 already. Oh the joy of a lost hour of sleep, but the sunshine this evening made up for it. I’m gonna enjoy this summer I think. I had oatmeal this morning. 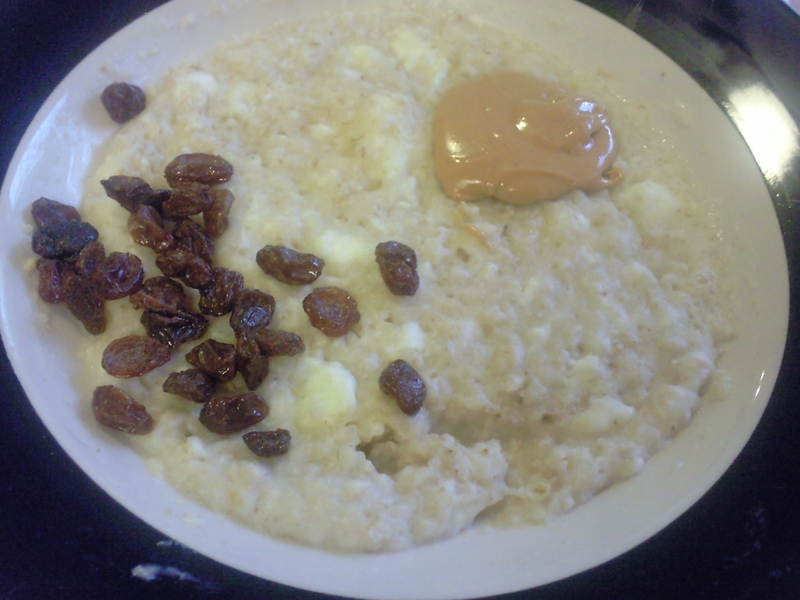 I don’t usually eat oatmeal that often for breakfast and I don’t understand why not. Sunday’s call for a little variety though. This was my first time to incorporate egg whites in with the oatmeal, and I really enjoyed this bowl. I am defiantly going to try some savory oats soon, maybe with some spinach. 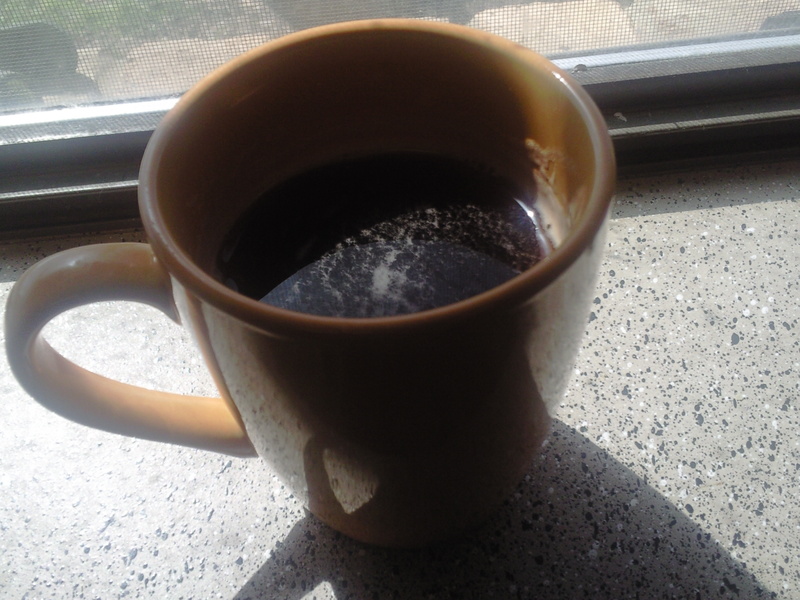 I also had a cup of Tazo Black Tea. 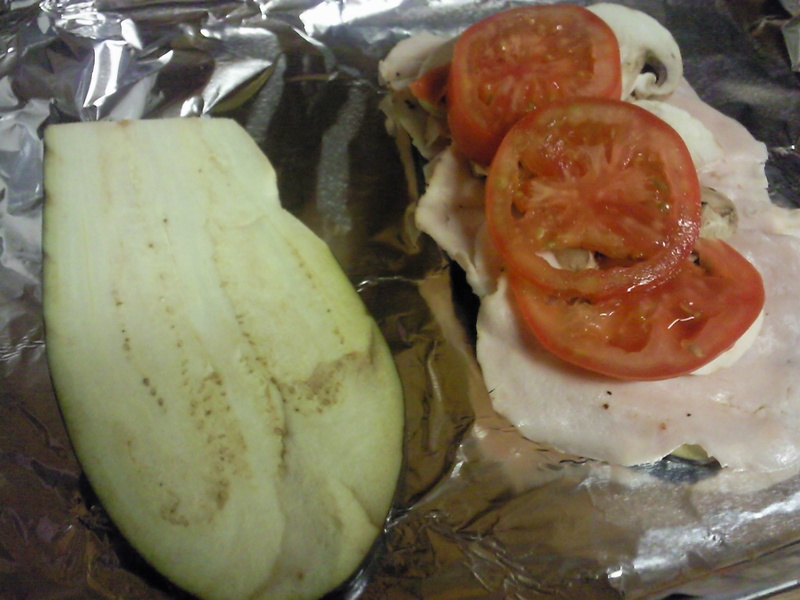 Lunch went un-pictured. We ate out at a local Mexican food joint. Just imagine chicken tostadas with 2 HUGE scoops of guacamole! Grocery shopping ensued, and we replenished our food supply. Hooray! Really, I do love going grocery shopping! Baby girl skinned both her knees…about 3 seperate times today. Poor thing! Nothing a few little SpongeBob band-aids couldn’t cure though. 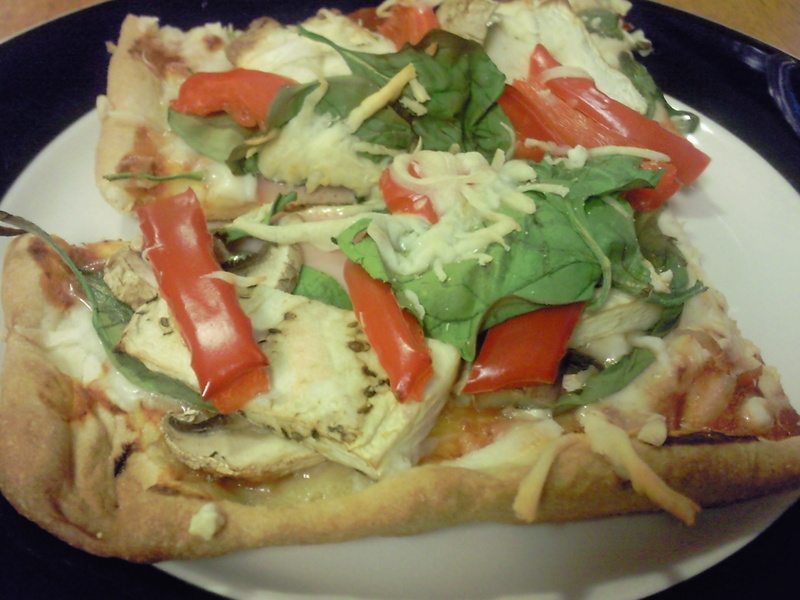 Dinner tonight was an awesome homemade pizza! 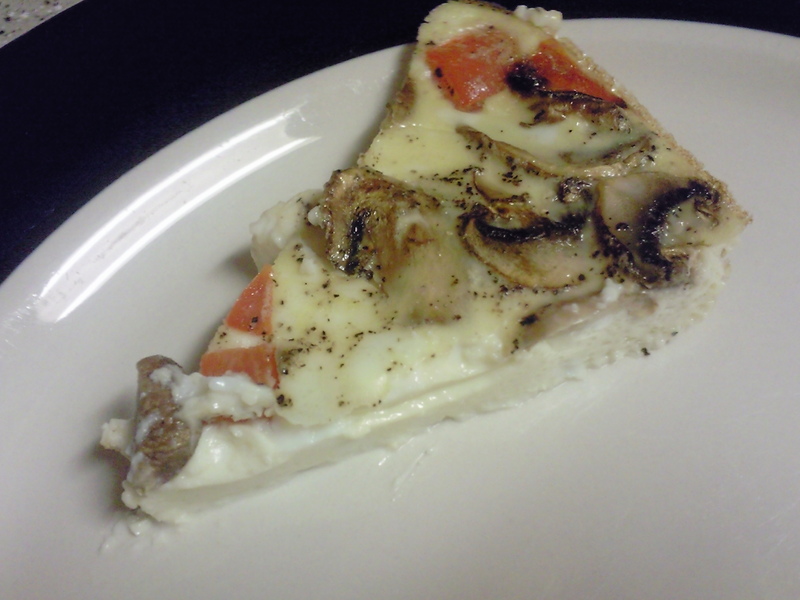 I love homemade pizzas! Not a big fan of the take out/delivered kind, but I’ll eat a wholesome made at home with REAL ingredients pie any day! I made my portion piled high with sliced Canadian bacon, eggplant, red bell pepper, sliced mushroom, spinach with mozzarella sprinkled over and in between. 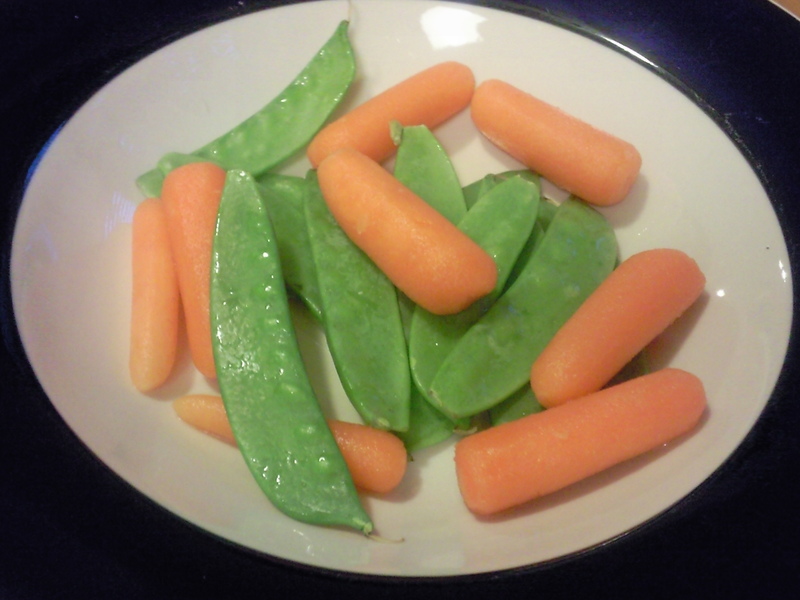 I also enjoyed a bowl of baby carrots and snow peas. Well now I am trying to decide on what sweet treat I will indulge in tonight. I will be sure to fill you in! Hooray for Wednesday! Happy Hump Day people! So B was still pretty sick last night and he didn’t have much of an appetite. I decided to take advantage of the opportunity to feed myself something unique that only I would eat. I don’t like making special meals just for myself at dinner. 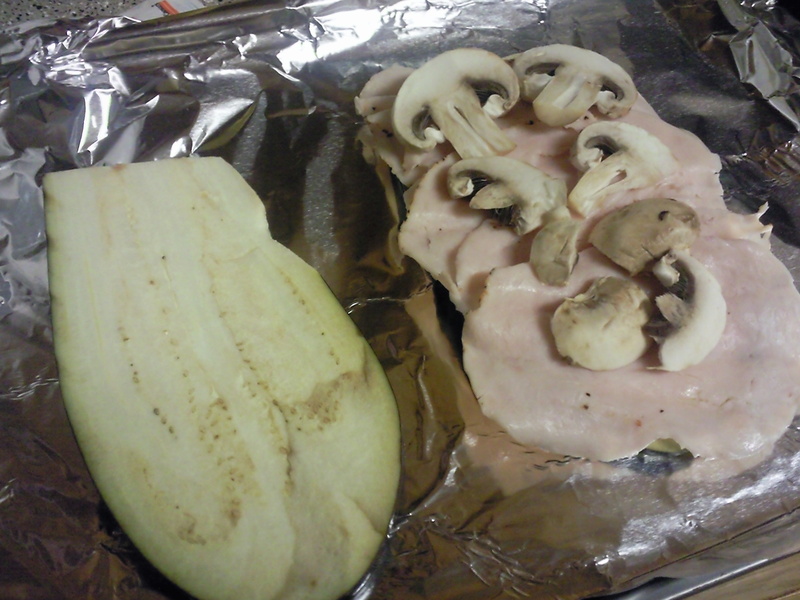 The kids have to eat what we cook, so I don’t break my own rule! Last night was the exception though. While the girls enjoyed pancakes and eggs for dinner…their request and who doesn’t love breakfast for dinner?! I made an eggplant parmesan inspired by running, eating, & living in the real world’s dish, and a baked egg casserole courtesy Low…and behold’s recipe! Go me! I don’t cook, so this was an accomplishment! 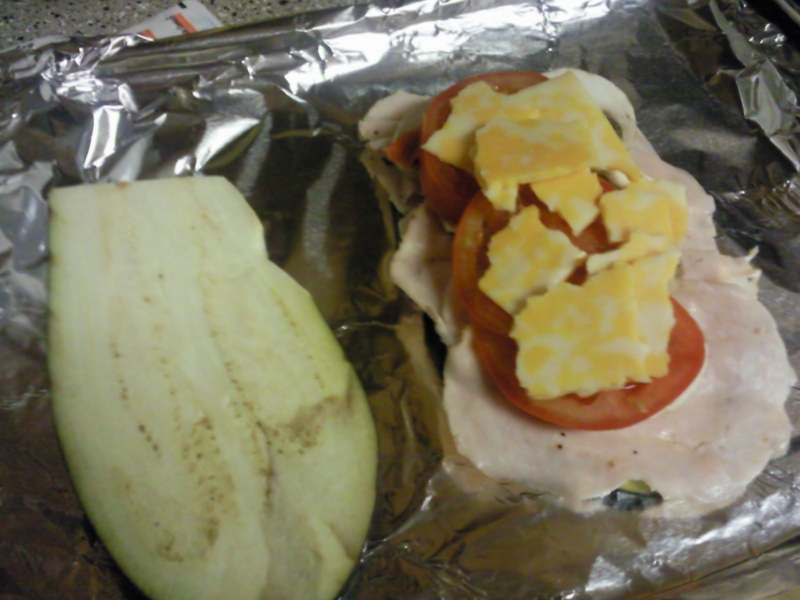 I layered it with sliced roma tomato and reduced fat colby crumbled on top. 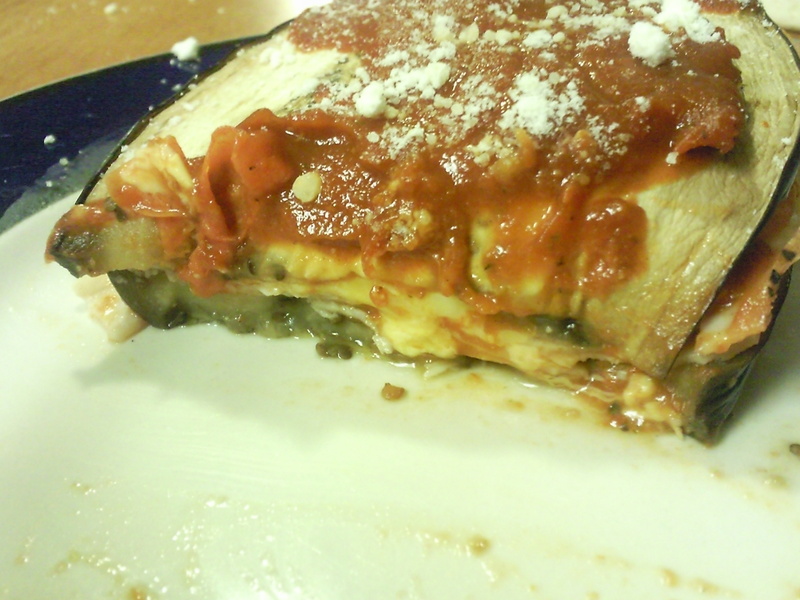 I didn’t have marinara sauce so I used some squeezy pizza sauce we had, and it worked!! 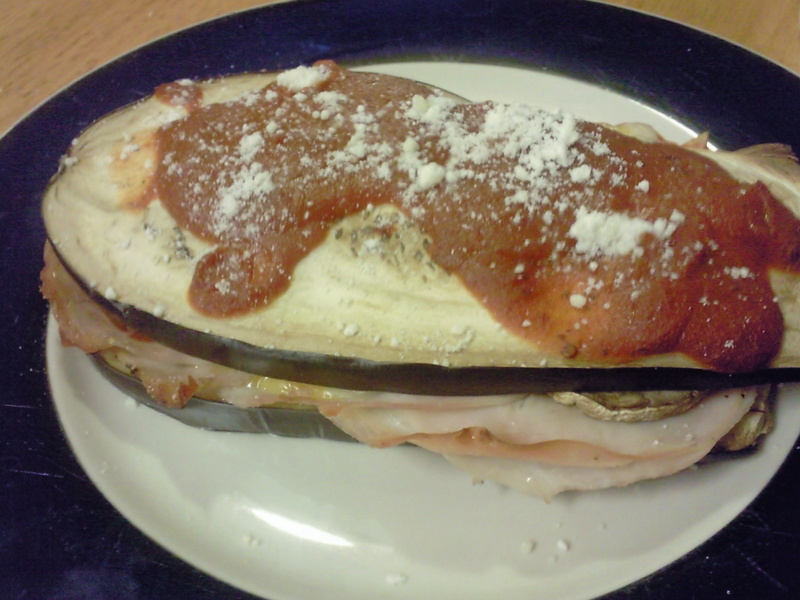 I topped it off with the slice of eggplant and baked in the oven at 415 degrees for 15 minutes while I gave the girls the quickest bath of all time. 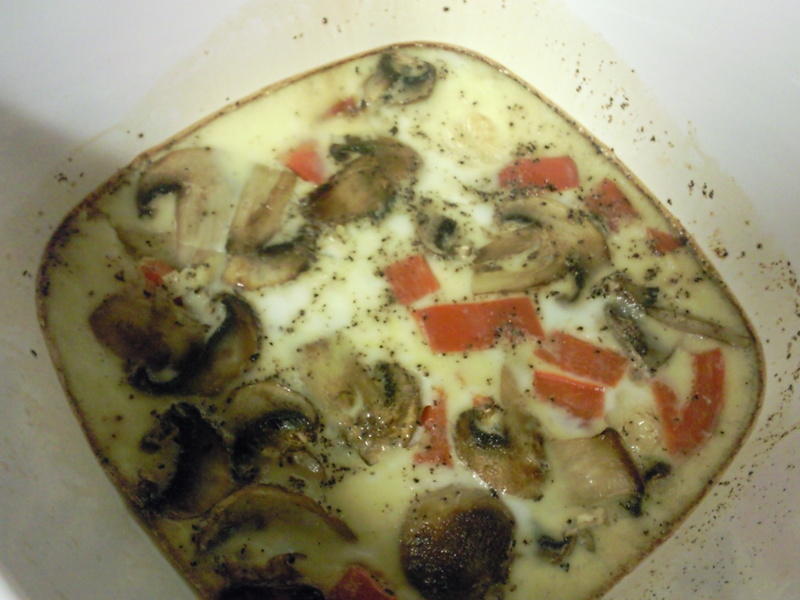 I also had made the baked egg dish. Don’t let that little slice fool you because I ate the whole thing! So needless to say dinner was amazing at my little table for one last night. 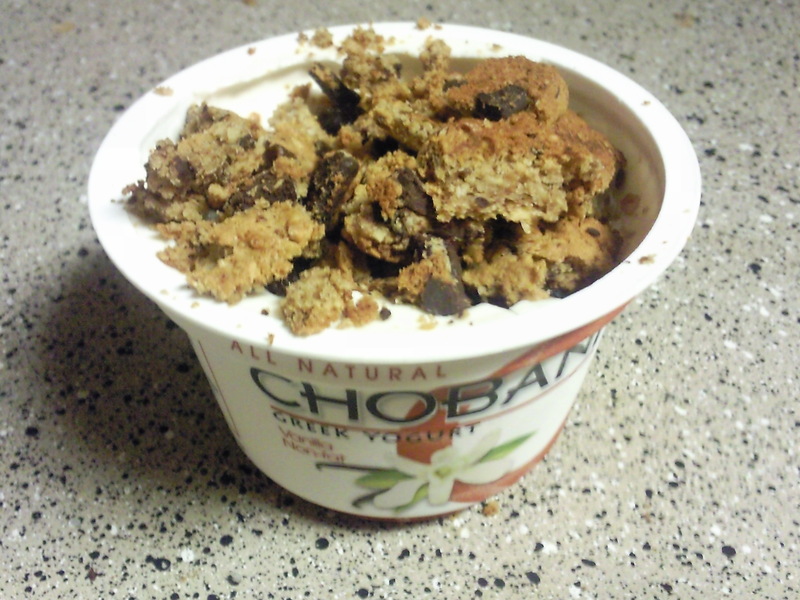 I finished the night off with a vanilla Chobani mixed with a dark chocolate chip flax cookie and some raisins. This morning I woke up feeling like after all the egg I ate last night I needed some oatmeal. 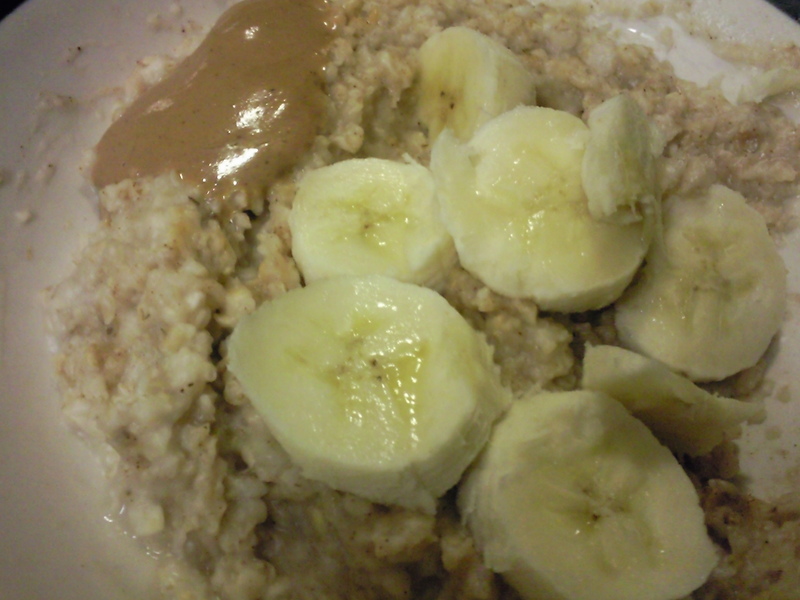 I whipped up a quick batch of 1/3 cups oats, 2/3 cup water, cinnamon, and 1/2 a banana. I also added a little PB too. Off to enjoy the rest of this rainy stormy day. Oh yeah the sunshine has left us again folks. Oh well! I do like the rain too. Patience, the sun will soon be out in full force before I know it! I just need to keep my positive energy flowing and make sure this headache I have doesn’t turn into a full blown sick-ache. That’s how B started getting sick was with a headache. Ugh!